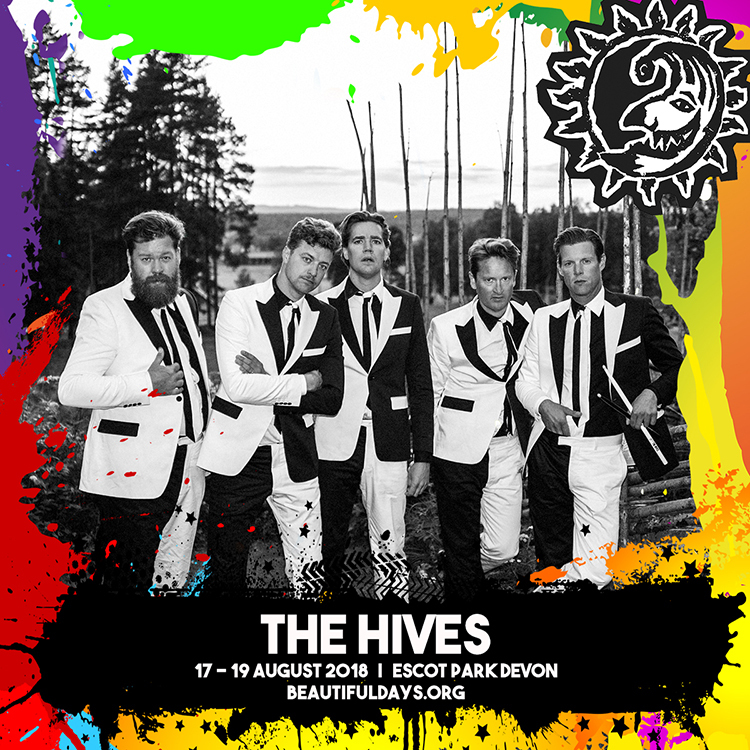 Monochrome five piece The Hives will headline Friday night at Beautiful Days. The unconventional Swedish rockers, whose hits including ‘Hate To Say I Told You So’, ‘Tick Tick Boom’ and ‘Walk Idiot Walk’, are renowned for their unmissable and energetic live show. Also added to the Main Stage bill are Manchester band Slow Readers Club whose latest studio album stormed the UK Top 20 on release in May, plus London blues band The Dualers and South West rock band Tax The Heat. Completing the Big Top line-up are guitarist Richard Durrant, 4-piece Indie-Americana group Carousel, Kitty MacFarlane and Curse of Lono. The Bimble Inn’s 2018 musical line-up will include Black Water County, Brickwork Lizards, GU-RU, Huw Eddy & The Carnival, Jake Morrell, Jamie Freeman, Little Unsaid, Mag Dog Mcrea, Naomi Bedford & Paul Simmons, Novatines, Oh Mama, Reverend Ike’s Sunday Soul Service, Stella Martyr, The Adventures Of…, The Embers, The Lagan and Vibe Machine. The Rebel Tent will host discussions, talks, panels and Q&As throughout the weekend including ‘The USA vs Me’ with internet activist Lauri Love, ‘Corbyn, Palestine and Labour’ with Jewish Voice for Labour members Jackie Walker & Leah Levane, ’21st Century Socialism in Venezuela’ with Venezuela Solidarity Campaign spokesperson Teresa Teran, ‘The Global Battle for LGBT Rights’ with human rights campaigner Peter Tatchell, ‘War, Media and Propaganda’ with a panel including former UK Ambassador to Syria Peter Ford, Vanessa Beeley, Patrick Heningsen & Piers Robinson plus former UK Ambassador to Uzbekistan Craig Murray discusses ‘The New Cold War’. ‘Syria – What is to be Done?’ is the topic for discussion with Peter Tatchell, Peter Ford, Vanessa Beeley & Hilary Wainwright and then ‘A New Politics from the Left’ will be panel debate for Hilary Wainwright, Rachel Shabi, Alex Nunns, Chris Williamson MP and finally ‘Human Impact on Climate Change’ is the topic for physicist and meteorologist Piers Corbyn (older brother of Labour Party leader Jeremy Corbyn) & Richard Betts. The Rebel Tent will also host live music from Flamin Wet Gurus, Mark Chadwick (Solo), The Chalk Outlines, Digga Ranks and the Leviticus DJs. Scary Dave hosts comedy in The Theatre Tent on Friday and Saturday night with Paddy Lennox, Brian Damage & Krysstal, Samantics Unplugged and Earl Okin. Plus the return of The Beautiful Days Joke Competition.